So here we are, hooves deep into April and nothing much has been going on in LoE. Well here's something that will maybe brighten your day. April 15 is Lens Flare's birthday so there will be an exciting party for that one. In other news, this month is National Poetry Month. So in celebration, this Saturday, April 13 at 8PM GMT we will be holding a Poetry Slam at the Ponydale Schoolhouse. Please come and read a poem or two that you've written or just listen to the poetry shared by others. We hope this can be a fun and exciting event for all! This isn't a PONI sanctioned event but this will be occurring very soon. Your Princesses need you to join up (because they've fired all of their other guards). 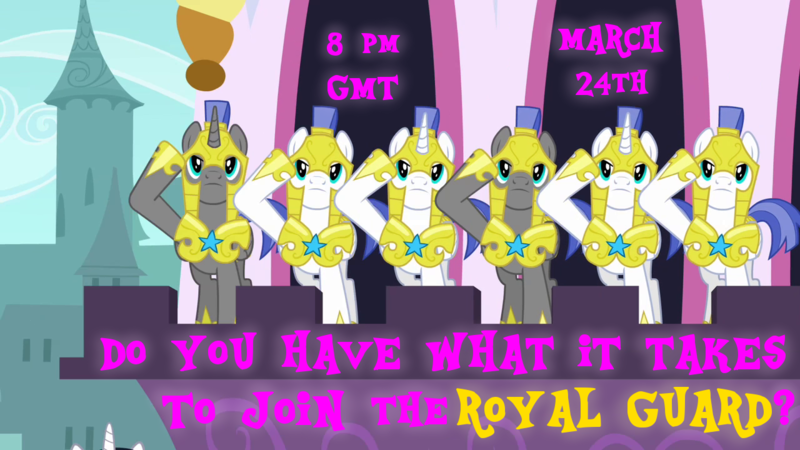 Please come to the Cantermore training area (near the Castle) this Sunday, March 24 at 8PM GMT to participate in a series of contests sponsored by the Royals. The winner(s) will be made honorary members of the Royal Guard and will be given the glorious duty of serving their royal princesses. IMPORTANT: All participants must bring a suit of bronze armor. The Royals don't have the budget to buy your training armor (more important things must be paid for, like cakes). This promises to be fun and we hope to see you there! Just an update on upcoming events and birthdays. Friday March 1st is Jet Black's birthday and there will be a party in SCC. This may be held fairly late but be sure to hang around SCC as there will likely be festivities all evening. On Saturday, March 2 starting at 9PM GMT, meet at the Cantermore Unicorn School grounds and bring a costume to celebrate CARNIVAL (US Mardi Gras). We'll be celebrating with a parade through Cantermore and a dance party at the Gala Hall. Prizes will be given for best costume! THE EQUESTRIA WINTER GAMES ARE OFFICIALLY WRAPPED UP. I would like to thank all of the participants especially those those devoted weeks of their lives to working hard at training for the Games or planning the rules and other activities for the Games. I would like to thank the members of PONI, especially Berry Shade and Even Tide who single hoofedly ran most of the events for the Games and without who we would not have had this amazing event. I would like to thank our trafficorn volunteers: Optic Rainfall, Ivory Nightfall, Pumpkin Glow, Healing Lavender, Aurora Gem, and Shoo De Boop who helped keep the rules on track during the events. I would like to thank the ponies who threw the afterparties between the Games days, ponies like Random Fandom and Flutter Fly. These points are calculated from the medals earned for 1, 2, 3, and 4 place with 1st being worth 4, 2nd being worth 3, 3rd being worth 2, and 4th being worth 1. Points were calculated for teams and not individuals as there were some events where one team technically won multiple places. 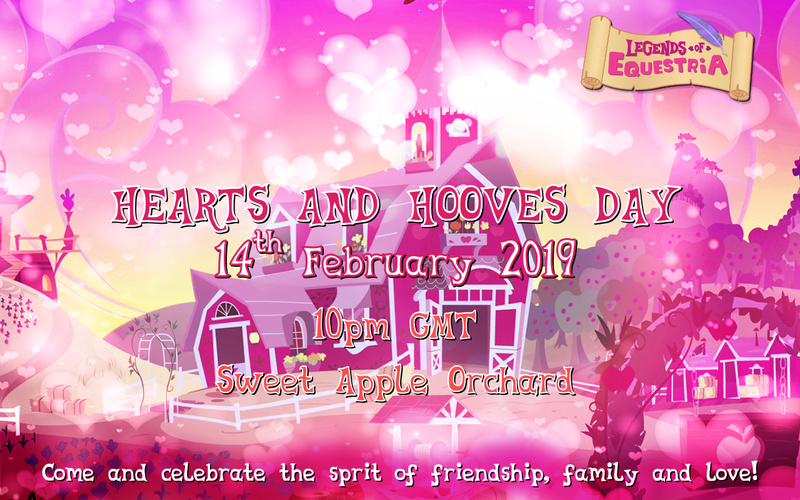 Everypony who participated is a winner and I sincerely hope that we will continue to have all of you in our lives as the months go by and more exciting events happen in LoE! Big News. We have officially settled on the Event Schedule and Times for the Equestria Winter Games. As shown in our beautiful promotional graphic (courtesy of Gloomy Feathers ), the Opening Ceremony will be held Thursday, February 21 at 10PM GMT. This will begin at the Crystal Kingdom Stadium and will feature a parade to Ponydale the Official Host of the Winter Games. Then the following three days (Feb 22 - 24), there will be a earlier session and a later session for all events. This does not mean you need to attend both. This means the same events will be repeated at these times so more ponies can attend and participate. We hope to see as many ponies at the Games as possible and wish the best of luck to all teams! Just a bump because I updated all the times for the Nightmare Night events. We'll have a promo coming soon. I don't know the details for the treasure hunt or hide and seek games (or most of the events for that matter), but ask Berry Shade, Even Tide (Goomie), LeadMare (Pegafilly Twilight), or Melody Sweetheart. They've been involved in most of the planning for these wonderful events! Again I want to thank everypony that took the time to review this and to respond. I just want to give a few thoughts on what I observed through this whole process and then if whoever's in charge here wants to lock this and sweep it under the rug by all means do so. 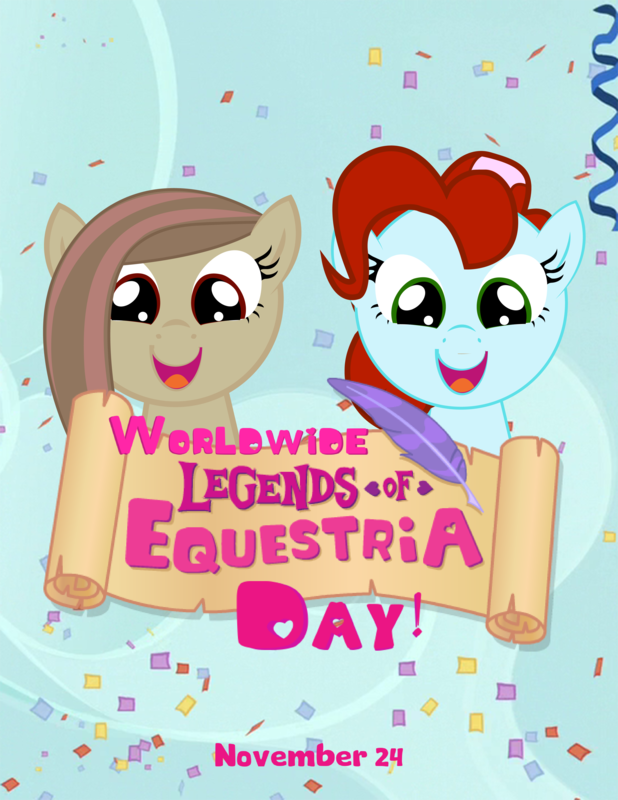 Personally I joined this movement because I care about Legends of Equestria and it is my firm belief that every single player who joins the game and who wants to play it should be entitled to a fun experience in a world that richly reflects the canon world of My Little Pony Friendship is Magic. I am trying to make it my life's mission to create that world through fun events, building lasting friendships for myself and others, and helping others with their personal problems. I believed in this cause because I felt that some ponies had not been given that chance to have that experience. They were singled out by a vindictive person or were the victim of a failed system. And that is truly a shame. But what I have seen come out of this letter and the following discussion is saddening. There is no real sense of community here. There are ponies on one side pointing hooves and shouting that the moderation community and other LoE staff never listen and give them what they want. And there are some very bitter people who have tried to make this entire process personal and drag down people with whom they have personal grievances. But there are some very real and useful points being made as well. And on the other side there has been nothing but denial and refusal to cooperate from the majority of the LoE staff to the point of absurdity. I know there have been some promises of changes and discussions and that is great, if it actually does come to pass. And hopefully it will. But there were some very harsh and uncalled for things said here by the Staff as well. And these are the people who are supposed to be looking out for our world and have its best interest at heart. In the end I think what we have here was very beneficial. It has demonstrated that there was a problem in Legends of Equestria. And whether that problem will continue to exist is up to both the players and the Staff. I can only hope that things will improve to a point where both sides of this can work together to create the experience we all deserve.